The UK and China have agreed on six areas to focus on in their continued cooperation in the education field, during a visit by high-profile UK cabinet ministers to Shanghai this month. "We both recognise and highly value the benefits of international collaboration," said UK Education Secretary Justine Greening at the UK-China Education Summit. Photo: British Council. During the annual UK-China Education Summit, the UK Secretary of State for Education Justine Greening and Chinese Minister for Education Chen Baosheng signed off on an Action Plan under the UK-China Partners in Education Framework that outlined key priority areas for education cooperation beyond 2016. It outlines six areas of collaboration: basic education; language teaching and assessment; technical and professional education and training; sports education and training; higher education (including quality assurance) and exchanges. Key aims of the plan include boosting business education links to accelerate skills development in priority industry sectors and increasing collaboration on innovation and entrepreneurship in higher education. The two countries will also work together more closely on school curriculum development, the plan states. One way they will achieve this is by supporting and placing language assistants in schools to support the learning of Mandarin in the UK and English in China. During the summit, it was also agreed that the Shanghai Math Teachers Exchange programme will continue for a further two years. The programme will see up to 140 teachers from each country travel to Shanghai and UK over the next two years. 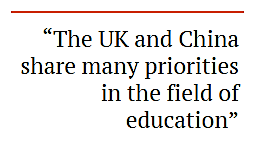 “The UK and China share many priorities in the field of education, and we both recognise and highly value the benefits of international collaboration,” Justine Greening said. The summit, which was jointly organised by the UK’s Department of Education, China’s Ministry of Education and the British Council, took place during the annual UK-China High Level People-to-People Dialogue.